Thousands of Nicaraguans have held a protest against the planned construction of a canal linking the Atlantic and Pacific oceans. The $50bn (£32bn) scheme, being built by a Chinese firm, will be longer, deeper and wider than the Panama Canal. But the demonstrators fear it will have huge environmental costs and force thousands off their land. 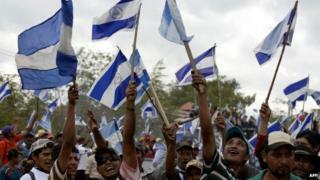 Nicaragua's government says the canal will bring vital investment to one of Central America's poorest countries. Some among the protesters, who were mostly farmers, accused President Daniel Ortega of selling Nicaragua to the Chinese. Initial site work began last December, with completion due in five years.